Android Users: The database can be stored on an SD card. Identify any bird of North America instantly with iBird Pro Guide to Birds, the world’s best field guide to birds. Whether you are an experienced birder or a beginner at birding, iBird Pro is completely up to date with the 2016 AOU and ABA checklist. 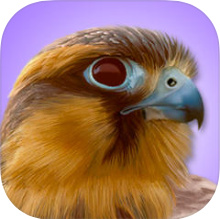 iBird Pro contains over 900 species of both native and rare North American and Hawaiian birds. With the iBird Pro’s avian matching system you can search for birds by color, location, shape, habitat or any one of our 37 identification field marks to find your bird (iBird Ultimate also has 37 search attributes while iBird Plus has 21 search attributes). iBird’s comprehensive species pages have 2,600 built-in bird songs, 4,500 professional high resolution bird photographs, 1,700 hand drawn composite illustrations and 1,000 range maps. Update 9.2 of iBird Pro Guide to Birds now includes iCloud for backing up and sharing your own photos, notes and favorites among all your devices. From tiny birds to angry birds, iBird works like magic, revealing a list of birds that perfectly matches your search choices. With over 1 million downloads iBird is the standard that all birding apps are measured by. ■ Identifies 940 species with in-depth descriptions including details on appearance, habitat, behavior, conservation, size, weight, color, pattern, shape, sexual differences and much more. ■ Ten hours of highest quality bird sound recordings. ■ This new update to iBird we have added 29 new drawings, 3 new search attributes to help you identify birds and other improvements you have asked for. ■ Download and Installation is must faster now with Apple’s App Thinning. ■ All screens optimized for tablets – illustrations, photos and range maps fill the screen.